Super chic floaty tunic top with V neck and contrast trim. 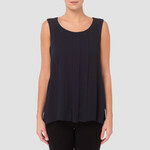 This high fashion top features a V neck at the front with an interwoven contrast trim. Striking black and white can fit perfectly into most wardrobes and can easily be dressed up or down. 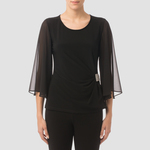 It benefits from a full sleeve and a relaxed floaty hemline that falls elegantly at the hip.